Heat the oven to 170F. 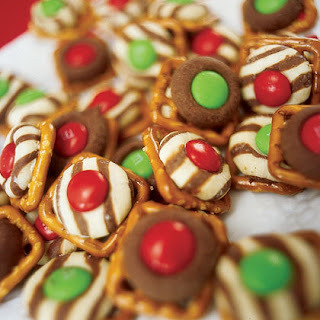 Set a number of bite-size, waffle-shaped pretzels (one for each treat) in a single layer on a cookie sheet lined with parchment paper, then top each pretzel with an unwrapped Hershey's Kiss or Hershey's Hug. Bake for 4 to 6 minutes (the white chocolate will melt more quickly), until the chocolates feel soft when touched with a wooden spoon. Remove the cookie sheet from the oven and quickly press an M&M's candy into the center of each Kiss. Allow the treats to cool for a few minutes, then place them in the refrigerator to set, about 10 minutes.